Cards in hands are essentially options that are available to players. The more cards a player has in hand, the better he or she can respond to a threat or recover after a loss. This is why most games of Magic revolve around which player can generate and deploy the bigger advantage in card count. It pays off to consider corporate strategy along the same lines: a competition about creating and implementing actionable ideas. A player with no cards in hand has to rely on what he or she’s put out on the board to win the game. That might just be enough, but being out of further options also means it has to be enough. Business Magic Lesson #4: Never run out of options. If you ever do, it’d better be because you did something truly amazing before. Of course, keeping all your options open indefinitely is not a real possibility. At some point, you will have to commit. If you don’t, players who throw caution to the wind will outperform you. Also, regrettable as it is, real life does not provide too many opportunities to just stock up your action portfolio. They are few and far between, which make managing them that much more important. If you cannot keep all your options up, you should make sure the options that are available to you are of high quality. 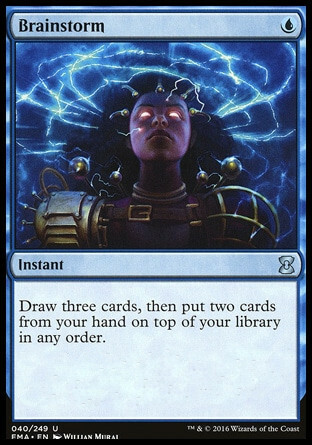 In Magic as in Business, there is only one solution to this problem: Brainstorm. This card is perfectly named. It does exactly what brainstorming should do for your decision-making. Business Magic Lesson #5: Brainstorming should not only give you new options, it should also lead you to rule out options that are not appropriate to your situation. Brainstorm gives you three new cards to look at, then makes you put two cards back on top of the deck. You’re also spending a card in Brainstorm itself, so at least on paper, you’ve not gained any net card advantage. You’ve gained three and lost three. Yet when you play Brainstorm, your options broaden immensely. You control which cards to keep and which ones to put back. Through selection, your options are gaining in quality. Brainstorming is a powerful tool. Contrarily to popular belief, it is not just about putting every available idea on the table. The evaluation and selection is an integral part of the process. Brainstorming is at least as much about narrowing down ideas as it is about broadening them. In Magic, Brainstorm forces you to evaluate. When you have put two cards away and look at what you are left with, you will find that the quality of cards you have left has gone up. Whatever situation you’re facing, you’re now better equipped to handle it. Your brainstorming sessions should do the same for you. You should always be able to act. Be it in Magic or in business, you should work on keeping a portfolio of actions that is both diverse and high-quality. Master brainstorming and evaluation.